The 152-page Medical Management of Radiological Casualties Handbook is available as a 604 Kb PDF file. The U.S. FEMA (Federal Emergency Management Agency) has info on Radiological Emergency Preparedness. Potassium Iodide (KI) is a simple means of protecting oneself from iodine radionuclides after a nuclear incident. See this Use of Potassium Iodide section and links therein at the U.S. Nuclear Regulatory Commission (NRC). This page was last updated Wednesday, October 31, 2018 and is copyright 2001-2019 by ILPI. All rights reserved. EMS Concepts for WMD Incidents. Terrorism Awareness for Emergency First Responders. The first course covers (1) Management of the Multi-Casualty Incident, (2) EMS Responder Considerations and (3)Medical Implications for Weapons of Mass Destruction. The second covers (1)Terrorism, (2) Weapons of Mass Destruction, and (3) Incident Command and Control. Narrated and animated topics include What is Anthrax, Types of Anthrax, Symptoms, Diagnosis, Treatment, Vaccination and Bioterrorism. 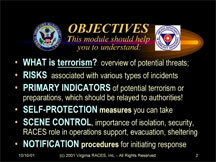 Adapted by Virginia RACES (Radio Amateur Civil Emergency Service), a non-profit organization, this 84 page module introduces emergency responders and planners to terrorism threats, planning and response. ILPI has arranged to make this training program available here as a free download for non-commercial usage. You can download this file as an Adobe Acrobat PDF document (2.6 Mb; requires the free Adobe Acrobat Reader). Designed for the Emergency Management Institute (EMI) of the Federal Emergency Management Agency (FEMA), this course is designed to prepare hospital personnel to analyze hazardous materials situations, take the necessary steps to assure medical provider safety, and identify appropriate resources for decontamination and medical care. Although not strictly a terrorism preparedness course, you will find certain units that deal with chemical and radiological hazards. This National Fire Academy course is a self-paced, paper-based document and is designed to provide the basic awareness training to prepare first responders to respond to incidents of terrorism safely and effectively. Students who successfully complete the exam will be eligible for a FEMA/BJA certificate of training. It is available for download in PDF (5 Mb) format. The target audience is fire, emergency medical, hazmat, incident command and law enforcement responders. This course was developed by Dr. William Waugh, Jr. of Georgia State University for use by emergency management professors. It consist of 374 pages and topics include: history of terrorism in the U.S., domestic and international terrorism, law enforcement/national security aspects, applying emergency management framework, the structure of antiterrorism programs and preparing and responding to major events. Downloadable as a 724 Kb .exe file (i.e. Windows only, sorry). These downloadable PDF documents describe how to respond to an anthrax threat in a mail center. Who to call if you receive a threat. Resources available to help in the event of a threat. According to this guide, "You do not need to be a nuclear, chemical, or biological expert in order to survive an NBC attack; it is enough (and very important) to know the basics, and this booklet and proposed training course will cover them." The file is currently available as a PDF download (612 Kb). Major sections include preparation, equipment, decontamination, shelters, medical alternatives, home preparedness and suppliers. 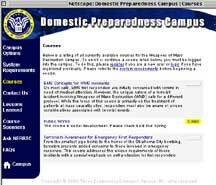 The CERT Training Materials were developed by the Federal Emergency Management Agency (FEMA). CERT involves partnership between community members (neighborhood organizations, communities of faith, school staff, workplace employees and other groups) and local government, emergency management and response agencies. These materials are not specific to terrorism threats, but include all ranges of potential emergencies. These materials are available as a free download in Microsoft Word, Adobe Acrobat and PowerPoint formats and are also available in Spanish. An FAQ about CERT and streaming Real Video training presentations are also available.